Today I’ll show you 5 best ground blind for bowhunting reviews. You're no longer afraid of falling from a tree as well as can get the deers close without spooking them. The best part? You're going to find out ground blind vs tree stand later on. In case of still confusing, the last part tells you how to choose a good pop up blind. What Can a Ground Blind Bring to You? When it comes to choosing a blind that will keep you safe and dry in terrible weather condition during deer hunting, my prime choice will be the Primos Double Bull Deluxe Ground Blind. Once you start using this blind, you won’t want to use another ground blind. The Double Bull Deluxe is one of the best deer blinds on the market designed with the great materials to blend perfectly with your hunting environment. They'll keep you hidden from game. With 77 inches hub to hub measurement and a floor space of 60” by 60’’, the Bull Deluxe Ground can accommodate two people on a bowhunting setup and still give you the flexibility to move around. Unlike other blinds, this 2 person ground blind offers a 180g front silent window that allows you to adjust it to a better height to fit your shooting position. The Zipperless double-wide door is a spot on. It slits silently and opens everything up for better filming and silent entry. So now, you're not worried about spooking deers any more. Setting up this blind is as easy as peeling off a hard-boiled egg. It should take you less than 15 seconds in putting it together effortlessly. To add to its profile, the Primos comes with stakes that let you anchor the blind to the ground to prevent it from moving with strong winds. And you can sit on a chair comfortably to take a shot at the game right in front of you. The nice thing about the Barronett is that it’s huge and spacious. The Barronett Blinds GR351BT Grounder is designed to fit in 3 people comfortably. This blind offers an 80” height at the center for standing shots and 70” by 70” floor space to give you and your colleague's plenty of room for gear. With its 90” hub to hub size, It offers a lot of elbow room for up to three hunters. The ground blind is comfortable and portable to carry with you on the go. It offers a backpack style case that makes it easy to pack in and out for the day and weighs around 19 lbs for easy, and quick transportation. The Ground Blind also comes with a Peekaboo noise-free window so you can peek at the back of the blind in case you hear something. For bowhunters and rifle hunters, this ground blind offers a shoot-through mesh which hides you behind the mesh. Does this blind offer a tie-down rope or comes with tie-down stakes? Yes, this offers 3 tie-down stakes and ropes to ensure that the ground blind is firmly located in the ground to hold against blowing wind. Oh, let’s not forget that this blind is super easy to put up and tear down in just a few seconds (probably 30 secs). I also love the fact that it has the vertical branches and meshes that blend perfectly with your surroundings. Barronett claimed that the ground blind is waterproof, but I figured out that it is only waterproofed to an extent because it leaks slightly through the windows when it is raining heavily. However, you cannot sit and shoot from this blind. This is because the windows are a bit too high, forcing you to stand and shoot. Well, I wouldn’t count this as a deal-breaker as this seems to be one of the top rated ground blinds that are available on the market. If you think the Barronett Blinds GR351BT Grounder 350 is big as a hotel for hunting, then check out its elder brother the Big Cat 350 Hub Hunting. While the Big Cat was designed to retain the same sweet perks of the GR351BT Grounder 350, it also comes with other fresh additions, which seems to put it a step above its brother. While the Barronett Blinds GR351BT Grounder offers you 3 large windows and a single peek window, the Big Cat came out smart and robust by providing you with 6 trapezoid windows and 2 peek windows. The Big Cat features low profile windows that allow you shoot a game comfortably even while sitting on a chair. You’d recall that one of the downsides of the Grounder 350 is that the zipper window is noisy when adjusting it. But this time around, Barronett claims that the Big Cat 350 came with an improved Zipperless window that has a noise-free adjustment. Well, how true is that? I’d say that Barronett is right on point. The ground is as quiet as a mouse-thanks to its elastic hooks placed on the mesh screens with different attachment points on the windows of the blind. With that said, the Big Cat also took a page from its predecessor by offering the same material as regards to thickness, and hub structure. Although it is designed to hold pretty well in rain and light snow, you will notice some light leaks when it is raining. I will also advise against taking it out when there is heavy snow as this might destroy the blind because it isn’t sturdy enough to handle heavy snowfall. With that in mind, I wouldn’t want you to underestimate this blind as this is one of the sturdiest blinds you can get for the price. You can even decide to leave it outside for as long as you want and still meet it in one piece. I had colleagues who left their blinds out in the woods for more than a year, and it is still holding up pretty fine. If you are looking for a ground blind that is more affordable than the previous products we have reviewed, then check out this particular brand. Even at a budget-friendly price, the Realtree Xtra is perfect for both deer and turkey hunting using a rifle or a compound bow. One of the selling points of the blind is that it has 3 windows which are stationed on the 3 sides of the blind. That means you can quickly take a shot in any direction as long as the windows are open. Should in case you have a game in front of you and it swiftly moves in another direction, you can easily swivel in your seat and shoot the deer through any of the windows it passed. The Windows are super solid and setting up the blind is as easy as ABC, and it is easy to tear down. But, I discovered that the windows are too loud when trying to open it up. And this seems to be a major drawback to this ground blind. This blind also keeps up the pace with its competitor by being roomy and can contain two adults with the comfort to take your shot while sitting on a chair. The blind boasts a capacity of 69“ Shooting Width x 66” heights. Beautiful, but is it 100% waterproof? This is one of the best pop up blind for bowhunting you can find around even at a dead affordable price. It is skillfully designed to keep you dry on a rainy day but still comes with signs of some leakage after a rainfall. So, I wouldn’t say it is 100% waterproof. The last ground blind on our list is another one from Ameristep, which happens to be the cheapest blind on this countdown. With the size capacity of 60’’ shooting width and 66’’ heights, this ground blind can contain two people if only they can squeeze in themselves. So, it will not be too comfortable for two men as it doesn’t offer plenty of room compared to other brands on this list. Just like its predecessors, the Doghouse is easy to set up and weighs around 14 lbs and backpack straps for easy transport and mobility. Can you leave it out in the woods for a long time? With 100% Polyester and a Portable & compact design, you can set this ground blind out in the weather for an extended period without the fear it will wear out. As long as you tie down the stakes firmly to the ground, the Doghouse will hold up pretty well. How many windows for shooting? Featuring a height that falls around 32 inches, the 1RX2S010 Hunting Doghouse comes with 4 zipper windows in each of the four sides. The only thing that didn’t add as fun is that the windows aren’t silent as opposed to other ground on this list. Is the ground blind waterproof? Our findings show that this blind isn’t 100% waterproof, but it is water resistant. You can make it waterproof by using a silicone treated waterproof tarp in between the blind material and the roof poles to give you that added protection from rain. To help you clear off the path in buying the best ground blind for archery hunting, we have pen-down a few important factors that will not only help you make the better decision but will also make your hunting adventure a pleasurable one. So, let’s dive right into that. A good blind should come with the perfect weight that can withstand stormy wind or unfavorable elements because you never can tell when your hunting situation is going to change. It should be lightweight and can be carried for a long distance with great ease and comfort. A good ground blind should be easy to carry from one hunting destinations to another. It should offer you comfortable shoulder straps and extra safety strap to help you conveniently carry it from one place to another. This kind of ground will not bounce around when carrying it and should give you that free hand to carry your gun and ﻿bow with you. 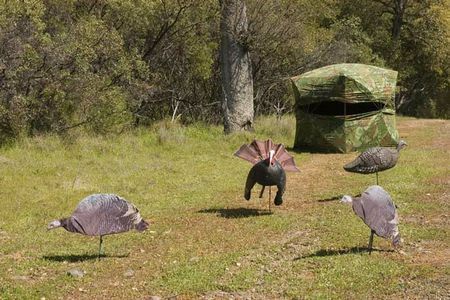 ​It’s crucial you have a ground blind that you can set up quickly once you get to your hunting destination. Personally, I prefer to go for a ground that can be set up in around 10-15 seconds. And it is also important to choose a blind that is very easy to tear down if you decide to change the location of the blind to somewhere else. When it comes to deer hunting, having a ground blind that fits perfectly into your environment are very important. Make sure you go for a camouflage pop up blind that is to prevent spooking your prey. 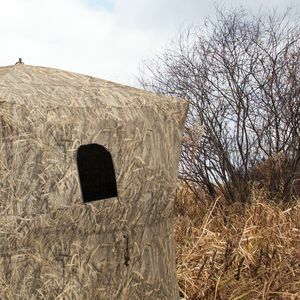 You need to find out if the blind comes with loops at the top and at the bottom that allow you to brush in your blind with grasses and reeds and conceal your presence. Also, ensure you spray in some scent killer on your body as well as the ground blind, as deer are quite sensitive to smell, and this might repel them from coming to that location. 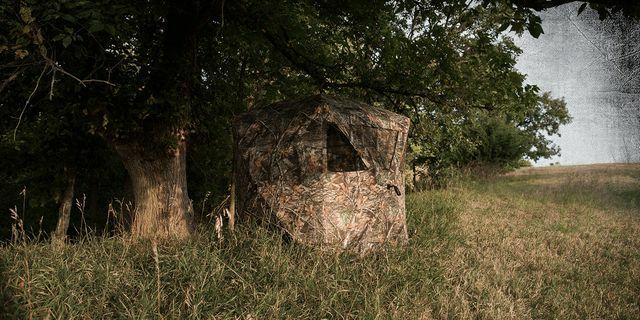 An effective hunting blind should be able to fit perfectly in any hunting location. Find out if the hunting blind can easily match your desired hunting location and at the same time give you a clear shot on games without being detected. Please note that it’s unlawful in some areas to cut sagebrush in public lands owned by the government unless it is a private land. Although others may get away with it, that doesn’t justify the fact that it is right. So, as an avid hunter, make sure you are aware of the laws that guide a particular hunting location before going there to hunt. Not all ground blinds are created to perform the same function or purposes. Some can blend perfectly for deer, turkey, duck, birds, etc. One thing I have learned about turkey hunting is that they are easy to fall prey to any blind that you set up close to it. Once you spot a particular location, you can quickly set up your blind a day before. With that, you should be able to pull them in. When to set up a ground blind for deer hunting? You should leave your ground blind in the private land at least 1 week before. So they can get used to it and never mind. Another important question you need to ask yourself when purchasing a ground blind is “how much room am I going to need in my ground blind?" 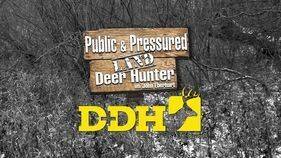 You have to consider the fact whether you are going to be hunting by yourself or with a partner. You also want to figure out if the ground blind is roomy enough for you to draw your bow fully. Is it tall enough (vertical height) to shoot a game while you’re standing up? One thing that is a must for a ground blind is a quick, silent window adjustment. Unfortunately, most ground blinds fail in providing this feature. But if you have blinds that offer this feature, then make the dive on it as this will boost your hunting experience. Currently, most brands feature a variety of window adjustments like magnetic windows, Velcro windows, and zipper windows. Some brands even offer 3-6 windows and also give you a 360-degree view on the game. 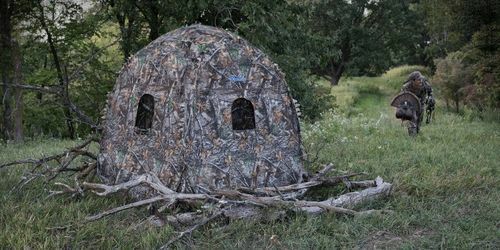 I’d recommend you keep an eye out for a good ground blind that has its windows located at different sides of the blind. This will help you swiftly take a shot in case the deer appear at a different direction. With that said, of all these windows, magnetic and zipperless windows seem to be making waves because it offers a quick adjustment without being detected. 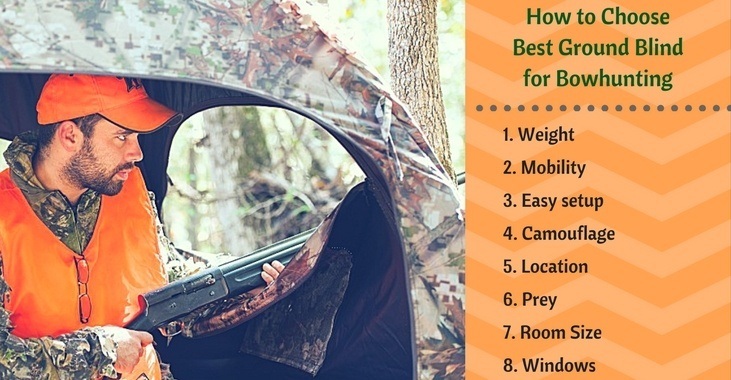 The above factors are just a few tips that will help you choose the best hunting ground blind to make you more successful in the field. 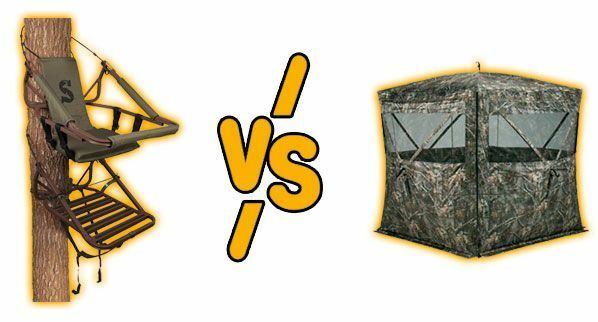 Let’s take a look at the difference between Ground blinds Vs Treestands. I have come across some modern-day hunters who think that you have to be many feet off the ground to not only hide from deer but also to get the best shot. While I think they might be right to an extent, I have come to discover that using ground blinds offer better results as opposed to a tree stand. Here’s a tabular representation of the pros and cons of both Ground Blinds and Treestand. To further explain the table above, here are some reasons, why we think ground blinds are so important compared to a ﻿tree stand﻿. You’d agree with me that ground blinds offer more mobility compared to treestands. Once you find a nice spot, the next step is to set the blind up within seconds and wait for the game to walk right in front of you. If you decide to change a particular location, the good news is that you can easily take down your blind within seconds (10-30 seconds), and off you go. Have you ever been in a situation in a tree st﻿and where the wind is blowing 40 miles an hour? How does it feel like? Of course, it is not a comfortable thing. With this unfavorable element, you won’t be able to aim a shot at a game. But you don’t have to deal with that if you decide to use a ground blind because it gives you maximum protection from wind provided you tie down the blind to the ground appropriately using the included stakes that come with it. Another beautiful thing about ground blinds is that it gives you that freedom and comfort to aim accurately at your target in a well-relaxed position. You can easily spot your prey right down there at a comfortable eye level while the animal walks directly in front of the blind. Of course, even my grandmother won’t afford to miss a shot at that close range. Another important reason why you should use ground blind is due to the fear of heights. I know some hunters who are afraid of heights. They are not going to be comfortable if they decide to use a treestand. Ground blinds are safer if you have kids. It’s a good advantage if your kids are small because they can get down below the windows of the ground blind and can also move around. Nothing impresses me more than a company who really understands a hunter's needs. Fortunately, we have successfully put together a unique assortment of the best hunting blinds, which should cater to a broad range of hunters and their favorite hunting genre. All the above Ground Blinds are currently garnering raves of positive reviews on the market due to their top of the line performance and satisfactory results. But, if you are confused on which ground blinds you should go for, then why don’t you consider our editor’s choice - the Primos Double Bull Deluxe Ground Blind? This particular brand is designed to give you the best concealment while hunting for deer, turkey or taking photos of wildlife. I’d recommend you take a close look at this brand as well as other ground blinds that suit your hunting needs and budget. 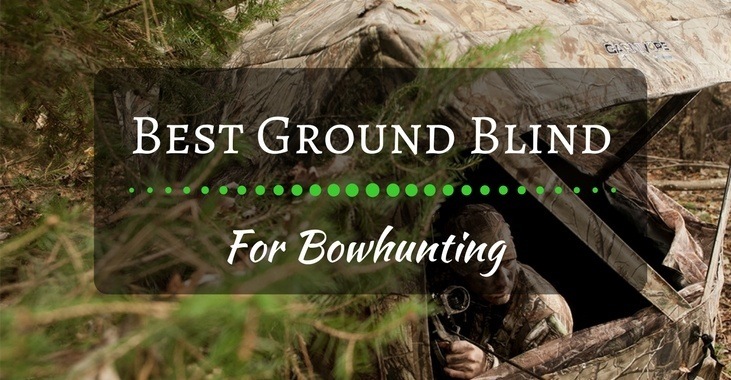 Please, do leave a comment down below and let us know what you think about our list of the best ground blind for bowhunting.